I have plenty of hard disks lying around my apartment, all in all, probably in excess of 2TB. The problem is they are too disparate: many are still IDE disks, some lie in USB enclosures, one in a FireWire enclosure (in hindsight, a waste of money, as USB 2 trumps FireWire 400). These disks grow old and fail one by one. I needed a central storage location to serve both as a trusted backup facility and a media server to allow single access to all the movies, songs and photos I’ve acquired. Another thing I learned the hard way over the years is that hard disks fail – and they do so at the most inopportune time, usually taking with them to the next life the most data they can. I needed to break my reliance on a single hardware source, but without the overhead of double and triple backups that I was using so far. Essentially, NAS (Network Attached Storage) is just a hard disk with an IP address. It exposes the storage as a volume to be mapped locally on any machine that needs to access it. NAS has been around for quite a while (I remember working on a NAS visualization solution for my last company back in 2002). Then it was rare and expensive, today it’s quite affordable and becoming more and more ubiquitous. It supports 2 hard disks of up to 1.5TB each, in RAID 0 (striping) or RAID 1 (redundancy) configurations. RAID 1 particularly suited my needs, keeping a copy of the data on the 2 hard disks, in case one fails, and doing so automatically (read more about RAID configurations). It has a UPnP media server that is compatible with my Xbox 360. All you have to do is drop your media files into a certain directory, and all files and folders beneath it are available to play on the Xbox (and at this point, I’m happy I got that HD-DVD player – it came with a media remote for the Xbox which makes it that much easier to play those files). Those files are also available to any PC running Media Center (supported in the Premium and Ultimate versions of Vista and 7), but this is redundant, since you can access the files directly from the OS. There’s an iTunes server, for all your Apple-bought songs and videos. I elected to turn my iTunes songs to MP3 files long ago, so I won’t be using this feature. A Printer Server allows you to turn any USB printer to a network printer, accessible by all machines on the network. I still haven’t mastered this feature and I’m running into slowness issues constantly. A Bittorrent client can download files in the background, freeing precious cycles on your laptops. Simply drop a .torrent file into a directory, and look at the “incoming” folder later for the result. The power management on this unit is superb. It conserves energy by switching to a lower consumption mode when it detects a long period of no action, and wakes up immediately as needed. Since the NAS runs Linux as its operating system, it’s easily hackable and expendable (which as my reader, you know by now is a major decision factor for me). A little extension called Fun Plug adds telnet access, sFTP, and even a web server to the NAS, opening endless opportunities, and various communities like DSM-G600 and DNS323Wiki will educate you further. Finally, the entire device is managed through an easy web interface. And the nice think D-Link offers (for all their products, BTW) is the chance to experience it hands-on prior to making a buying decision. To access the D-Link emulator for DNS-323 use "admin" as user and leave the password empty. I bought 2 WD Green 1TB hard disks (SATA 3Gb, 7200RPM, 32MB cache) and dropped them into the NAS (it formats them immediately, taking 3 minutes for both). I then mapped 2 volumes: a 500GB Raid 1 (for backup purposes – takes 1TB - 1/2TB) and a 1TB JBOD (Just a Bunch Of Disks – a way to accumulate all left storage into a single volume). I used the small no-need-to-install utility to map the 2 volumes to letters in all my machines. I use volume 1 for backup purposes and volume 2 for media sharing purposes – you expose the top folder in that volume on the UPnP server screen – and it immediately becomes available on the Xbox. All in all, 2 HDs + NAS enclosure set me back $340 ($160 for the enclosure and $90 for each HD. There’s a $30 mail-in rebate on the NAS, if you elect to fill the card). I also added the $36 ThermalTake BlacX external SATA enclosure to verify that the HDs work OK, and for general SATA direct access purposes. 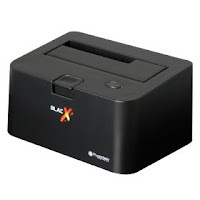 It allows plugging in any 2.5” or 3.5” HD and accessing it over USB or eSATA – great for verification, imaging and backup purposes. Am I right in thinking the iTunes server, the BitTorrent client, and the UPnP media server features all require the hacked firmware? I'm also considering this device or possibly a WHS box from HP. No, Melvyn, you are not. The iTunes, UPnP and Bittorrent servers are built in features. The hacked firmware adds Telnet and web servers, as well as some Linux commands - and it's definitely not mandatory. I still can't get my Xbox to see my DNS323. I am running firmware v1.07 on the DNS323 and both devices are hardwired to my Linksys WRT610N router. Could the problem be at my router? Robert, make sure UPnP is enabled in your router, as well as in the NAS. I have UPnp enabled on both my router and NAS. Is there specific port forwarding I need to enable as well? As far as see, no other setting (like port forwarding) is needed. Perhaps you have a firewall issue? Hmm, the DNS323 is a NAS appliance (no firewall), so it would have to be the SPI Firewall in my router? Possibly. Or anything else in your network configuration between the NAS and the Xbox. Have you tried the Xbox network wizard? it usually comes up with a suggestion (MTU or DNS) - but not always a good one. You could always try calling Microsoft support, or try one of the forums i mentioned in the post. Good luck! I just bought the DNS-323 and have a question: if you have RAID 1 and your DNS enclosure stop working; are you able to recover the files from the drives? RAID 1 is universal. You should be able to put the drives in another enclosure to recover the data. You could also use software recovery (takes longer).